“Don’t Cramp My Style,” FiveThirtyEight, 2015. After the emergence of Toxic Shock Syndrome, consumers grew suspicious of tampons. 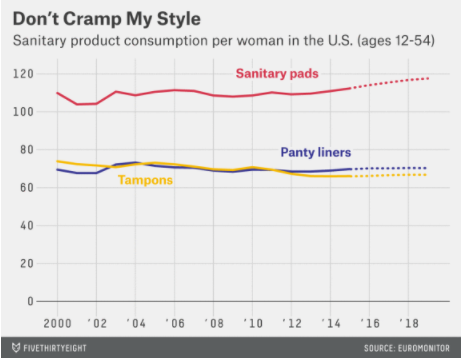 Since 1980, the percent of women using tampons has dropped from 70% to between 40% and 45%. Occasional cases of Toxic Shock occur each year and myths about tampons have spread, although they are no longer the only devices linked to the syndrome. The reputation of the tampon has never recovered.